OMRF scientists have made a discovery that could open doors to new treatments for multiple sclerosis. 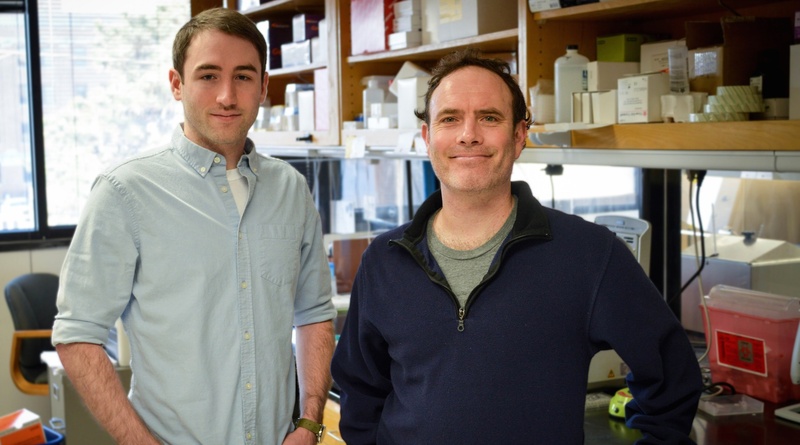 OMRF researcher Bob Axtell, Ph.D., and graduate student James Quinn found that, in laboratory mice, a particular white blood cell (known as TFH cells) seems to play a key role in MS. In multiple sclerosis, or MS, the body’s immune system attacks its own healthy tissues. In particular, it attacks myelin, which is the protective later that covers nerves and fibers throughout the body. These attacks cause a variety of symptoms, including issues with vision, muscle spasms, tremors and paralysis. The cause of MS remains unknown, making research into the disease crucial for improved treatment options for the estimated 2.3 million people living with the disease globally. To better understand what triggers MS disease in mice, Axtell and Quinn looked at the newly discovered TFH cells. Using mice engineered to develop an MS-like condition, the OMRF scientists found that TFH T cells communicated with B cells to drive severe disease. When they blocked the function of TFH in the mice, their disease lessened. “Knowing that TFH cells promote this cross communication with other cell types supports the idea that targeting these cells could be an effective therapeutic strategy for MS in humans,” said Axtell. The next steps will be further research to explore how TFH influences the development of MS and whether blocking it could lead to effective therapies for patients. “This is still early-stage work, but it holds exciting clinical potential,” said Axtell. Axtell joined OMRF in 2013 from Stanford University. Quinn, who has worked in Axtell’s lab at for three years, is a graduate student at the University of Oklahoma Health Sciences Center. The research was published in the scientific journal Frontiers in Immunology. Other OMRF researchers who contributed to the findings were Agnieshka Agasing, Gaurav Kumar, Ph.D., and Rose Ko, Ph.D. This research was funded by grants awarded to Axtell from the National Multiple Sclerosis Society (RG-1602-07722) and the National Eye Institute (1R01EY027346), and a training grant awarded to Mr. Quinn from the National Institutes of Health (T32 AI 7633-15).